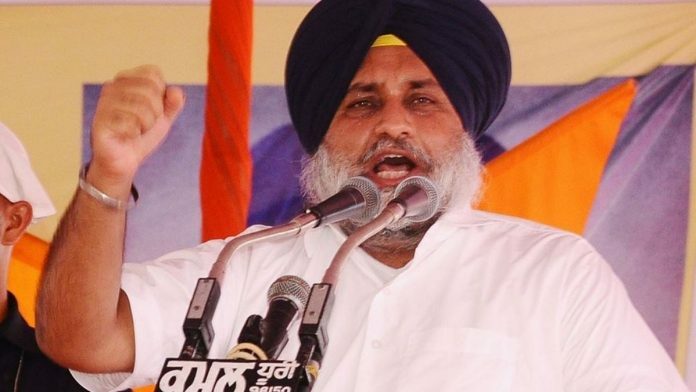 Chandigarh: Shiromani Akali Dal (SAD) president Sukhbir Singh Badal offered to resign from his post Sunday, at a time when the party is facing an implosion. But the offer doesn’t seem to have assuaged the senior leaders who have revolted against him. Answering a question during an impromptu media interaction in Amritsar Sunday, Sukhbir, Punjab’s former deputy chief minister, said he would work for the party only as long as the party wanted it. “If the party wants me to step down, I am ready to do it,” he said. Later, talking to ThePrint, he insisted that his offer to resign was serious. “I do not own the party. It is a democratic set up. And if partymen feel there is someone better to head it, I will be the first to move away,” he said. Senior party leaders have accused Sukhbir of mishandling panthic issues, leading to the party losing its core Sikh vote bank. Last week, Khadoor Sahib MP Ranjit Singh Brahmpura resigned from all posts of the Akali Dal citing old age. Brahmpura, along with two other taksali (old guard) leaders — former MP Ratan Singh Ajnala and former cabinet minister Sewa Singh Sekhwan — are leading the revolt. Last month, senior leader and Rajya Sabha MP Sukhdev Singh Dhindsa had quit all party posts on health grounds. “It is only an offer to resign. But if he does resign, I will welcome it. It is never too late to realise one’s mistakes,” Sekhwan told ThePrint. “In fact, Sukhbir should have resigned when the assembly results were announced. Our number (in the state assembly) has come down to 15. Brahmpura agreed that Sukhbir was unlikely to resign. “Sukhbir did not feel the need to resign after the electoral debacle of 2017, why will he resign now?” he told a TV channel. The Akali Dal initially tried to woo the unhappy taksali leaders, but now that they’ve hardened their stance, the party seems to have given up. “I was not contacted by anyone from the party after the 7 October Patiala rally,” Brahmpura said following his resignation last week. In Amritsar, Sukhbir, along with his brother-in-law and former revenue minister Bikram Singh Majithia, met Bhai Manjit Singh, another Akali leader who had joined hands with party dissidents. However, no efforts are being made to calm down the senior leaders. Sukhbir said Sunday he had great respect for the party’s senior leaders. “Whenever I meet them, I touch their feet. They are an inseparable part of the party,” he said. Sukhbir had presided over a party meeting in Amritsar Saturday, which was attended by Shiromani Gurudwara Prabandhak Committee chief Gobind Singh Longowal and several SGPC members. The taksali leaders, however, were absent. But Badal family loyalists say they have “no issues” with Sukhbir’s leadership. General secretary and former education minister Daljit Singh Cheema said there was no reason for Sukhbir to resign. “The Akali Dal allows freedom to everyone to speak out. The party’s senior leaders have said what they felt. There is no crisis,” Cheema said. Virsa Singh Valtoha accused the dissidents of having their own axe to grind. “Why did they not speak up in 2015 about the desecration issue? When the then Congress MLA Ramanjit Singh Sikki resigned over the desecration issue, Brahmpura’s son was made the candidate and he won the elections,” Valtoha, the former Khemkaran MLA, said.